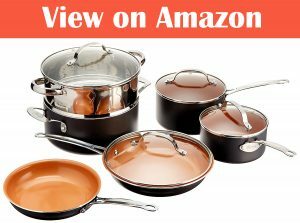 Both Gotham Steel and Cooper Chef offer some well-known cookware, that is well recognized and reviewed by many customers. But which one is better and more suited for your needs? I have used both options set of cookware for 2 months each to come to the conclusion and which is best for you depending on what your cooking needs are. Firstly, I will give my thoughts on both of the sets of cookware then after I will do a direct comparison between both. First off let me talk about the design and the style of this cookware. I do really like the style of these, they are contemporary and will work with any kitchen. They are made primarily from aluminum with a ceramic coating inside. The way the pots and pans are designed allows for the handles to remain cool even when cooking at higher temperatures. Even the handles on the lids have the same design element and remain much cooler and you can use them without getting burnt. As far as the weight of this cookware well they are quite lightweight thanks to being made of aluminum and they are still surprisingly sturdy and strong even considering that which is impressive. I did really enjoy cooking with this cookware. One of the things I personally really liked with this set of cookware was the how quickly they heat up and how well they maintain their heat. That’s one thing worth mentioning because of their lighter weight and material you won’t need to turn up your stove more than medium in most situations because of how well the heat passes through. Cooking with them is great and I never noticed any problems with sticking thanks to the non-stick Ticerama(titanium/ceramic) coating they have used when I was using oil. Though there were a few occurrences when it did stick but that is when I was not using any oil which is a downside if you don’t cook with oil often. Of course, as you would expect you can use these for any kind of cooking like frying, steaming etc. but also, they can be used both in the oven up to 500 degrees and even in the microwave. As far as cleaning these it was super simple. I personally just used a cloth and some soap and water and they where as good as new in a handful of seconds. I would advise against using a scrubber or something of they like because as the inside of the pan is made partially from ceramic which is more prone to marks and scratches when using something abrasive. Finally, these pots and pans can also be used in the dishwasher though I didn’t test that myself. Copper Chef cookware have a simple yet elegant design that I am personally a fan of. The main part of the pots and pans are made from copper with the handle being made from a stainless steel which is riveted which makes it easier to hold and grip. The handles are made from a different material than the base, so the heat isn’t transferred that much and that means the handles always remains cooler and easy to hold even when on high heat. As for the weight with these Copper Chef – they are heavier when compared with the Gotham Steel though they are still lighter than the average piece of cookware I have used. I personally feel they have a nice balance with them – that balance being strong and sturdy will still remaining relatively lightweight. When it comes to cooking with these they are a dream – in fact they are actually my favorite set of cookware and what I personally use in my own kitchen now. One of the things that impressed me with these is that they never stick. Even when you don’t use oil or butter I have never had any problems with sticking with them. They truly work as you would hope for. They heat up quite quickly though not as quickly as the Gotham Steel and they hold their heat very well. Cleaning them is also very easy thanks to the food never sticking. A little water and soap and they are shining in no time at all. I have a scrubber than is rougher though I rarely if ever have to use it for this cookware. One thing I also want to mention is that you can easily sue metal utensils with this cookware. I have been using these for almost one year now and they still look like they just came out of the box I bought them in. The point being is that they don’t mark or scratch and are extremely impressive when it comes to durability and toughness. On a final note the actually base of this Copper Chef cookware is made from a stainless-steel induction plate. That is in place to speed up heating and also to keep the heat distribution as even as possible which is does a perfect job of. Design – These two sets of cookware are both personally high on my list when it comes to appearance and aesthetics. They are also designed extremely well, and both have good elements such as the handles that remain cool throughout cooking. As far as which I prefer I would have to say the Copper Chef that is because they are more durable and get take more punishment. This is thanks to their build quality and the incredibly durable non-stick substance they have used. Cooking – As far as cooking goes both work really well. One of the differences is that the Gotham Steel heat up faster when compared with the Copper Chef though the Copper Chef seems to hold the heat a little bit better. It’s also worth noting that when using the Gotham Steel, you should use a lower cooking temperature. Cleaning – Cleaning for both of them is really easy, you don’t need anything fancy just a little washing up liquid and water and you are all set. 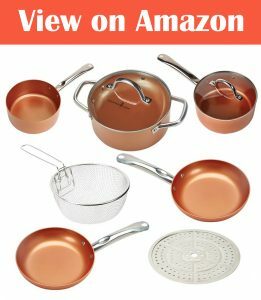 Non-stick – Both sets of cookware are said to be totally non-stick and while both do a good job the Copper Chef definitely does a better job. I had a few occasions where the food would stick when I was not using oil with the Gotham Steel though I never had that problem with the Copper Chef. Weight – Both sets of cookware are on the lighter side with Gotham Steel definitely being the lighter option. While Copper Chef is heavier it is lighter than the average cookware you may have used before and is still easy to lift even when full. Price – Both sets of cookware are affordably priced at around $100 for a 10 set of cookware. I can easily recommend both sets of cookware which provide some amazing quality at a good price point, though which do I prefer? Well if it wasn’t clear already I prefer Copper Chef that is because I think they are better built and more durable and cooking with them never causes any problem with sticking or food burning easily which is important for me. Overall when compared with Gotham Steel I feel they have the edge in most of the more important areas for me.